In our garden the Cyclamens always receive a lot of attention from visitors. Cyclamen do naturalise, only slowly. They’re best when planted in a fairly light area (sun/part shade). 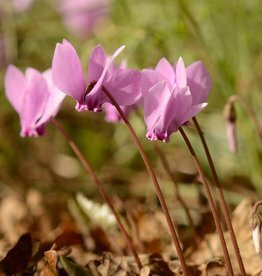 At the moment we have two sorts of Cyclamen in our assortment: spring-flowering cyclamens, and autumn-flowering Cyclamens. Before planting, soak the tuberous bulb for one night in water. Plant at a depth of 5cm, slanting the bulb so that water can’t collect on its top. Cyclamen prefer a chalky, loamy and well drained soil: when planting incorporate some leafmould and lime.